The Holy Roman Empire is no more. 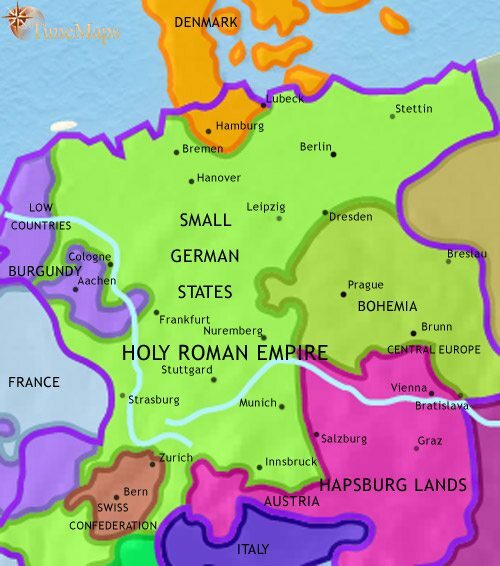 The German tribes have come under the rule of the newly-founded Holy Roman Empire. The unity of the Holy Roman Empire has been undermined by civil wars. 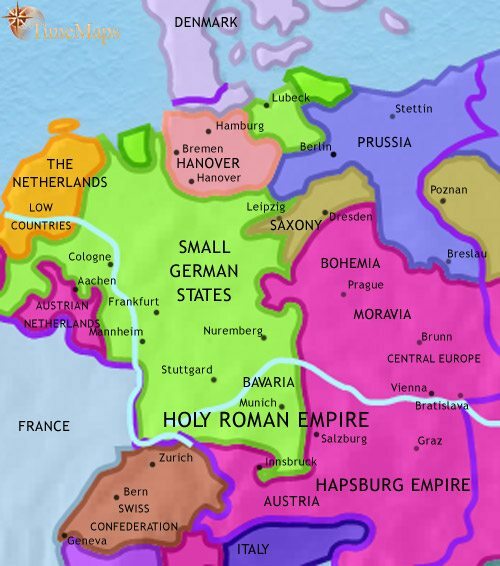 The Holy Roman Empire has now become a collection of hundreds of virtually independent states. Germany has experienced the terrible 30 Years War. Prussia has emerged to challenge Austria as the leading state in Germany. Prussia has united the other German states within the new German Empire. The German Empire is the most powerful state within Europe. After defeat in two world wars Germany is now divided into a communist East and a democratic West. Germany has become a united country again, its economy the most powerful in Europe. The more than twenty years of war which followed the French Revolution in 1789 deeply affected Germany. French armies occupied large areas of the country on several occasions, and it was only after some dramatic defeats that Prussia and Austria were able to rally, and lead the German states in the defeat of Napoleon. 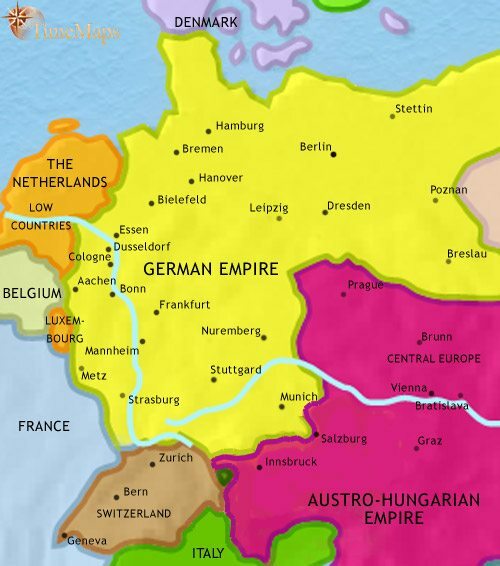 The political map of the region was altered for ever when the Holy Roman Empire was dissolved by Napoleon, in 1806. The Treaty of Vienna (1815) has created a Germanic Confederation, with Austria as President, and the more than 300 German states have been reduced in number to 39. 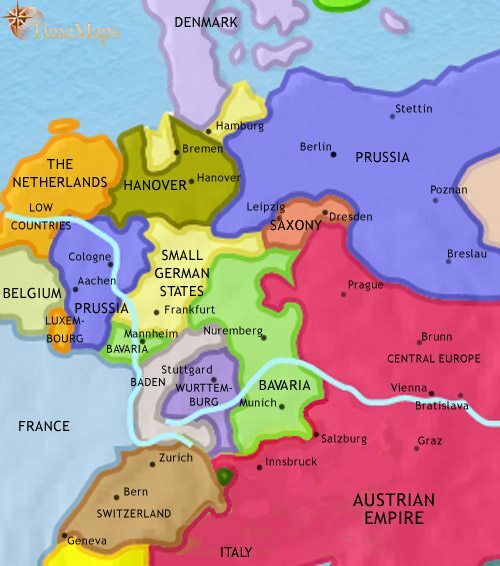 Prussia, as one of the leading victorious powers, has significantly expanded its territory, particularly in the Rhine Valley and Saxony. The German tribes were conquered by the Franks under Charlemagne at the end of the 8th century, and – often forcibly – Christianized. After Charlemagne, the Germans came under the rule of his descendants, the kings of the East Franks. 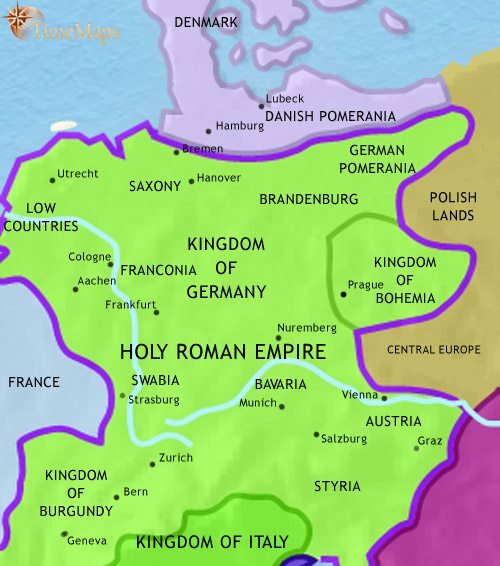 When the Carolingian line of East Frankish kings died out, in 919, the German dukes elected one of their number, Henry of Saxony, as their king (reigned 919-936). Henry and his son Otto (reigned 936-973) campaigned with great success, defeating the Magyars, expanding the East Frank realm in this region and conquering a large part of Italy. In 962, Otto had himself crowned emperor in Rome, by the pope. He thus founded that political entity known to European history as the Holy Roman Empire. The expansion of the Holy Roman Empire eastward is accompanied by the expansion of that branch of the Christian Church headed by the pope. Wherever the frontier advances into pagan territory – and sometimes ahead of it – the Church sets up bishoprics, and brings previously heathen peoples within the fold of Christendom. 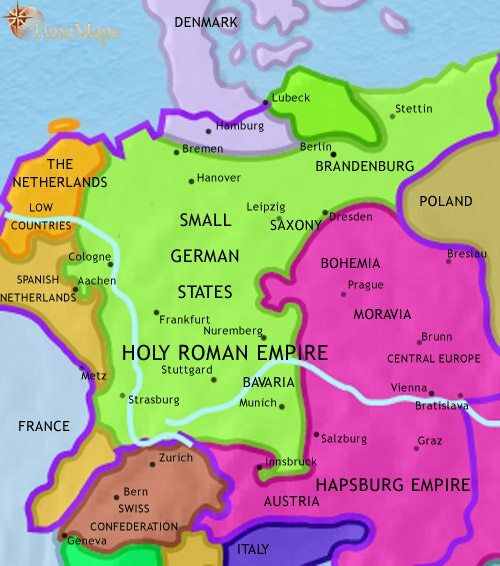 By the mid-11th century the Holy Roman emperor was the leading ruler within Europe. His power and prestige was such that he was able to nominate popes. Within his realm, the Church played a vital role in maintaining order and civilization within the empire, and in upholding imperial power, especially in the frontier regions. Thus, when the pope sought to assert control over the appointment of bishops, at the expense of the emperor, this was a direct challenge to the emperor’s authority. This led the the “Investiture Controversy”, which lasted for two generations and only ended in the Concordat of Worms (1122), a compromise which left both pope and emperor with a say in the appointments of bishops in Germany. This struggle seriously damaged the authority of the emperors, which was followed by a prolongued civil war for control of the imperial crown. Anarchy spread throughout Germany and centralized authority virtually ceased. Local magnates and cities were left to manage their own affairs, and even after the anarchy was brought to an end by the strong rule of Frederick Barbarossa (reigned 1152-90), these local powers were left largely untouched. While this political fragmentation was occurring a population upsurge has been taking place in Germany (as in other European countries) and thousands of German peasants are seeking farmland in the more sparsely populated regions to the east, especially in Saxony and Brandenburg. 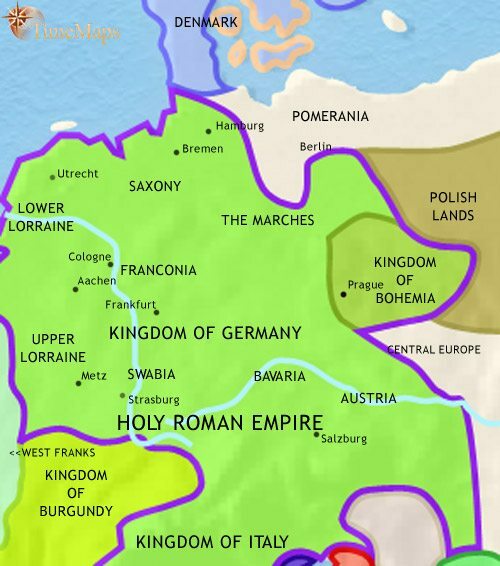 In the north east, the Holy Roman Empire expands with the annexation of the duchy of Pomerania (1181). The emperor Frederick II (1212-50) was not only Holy Roman emperor; he was also king of southern Italy. This is where he had been brought up, and was his chief concern. While he sought to strengthen his power in Italy, the German magnates were left largely to their own affairs. After his death, the imperial crown fell once again into dispute. The power of the German magnates continued to be enlarged as opposing candidates showered favours and grants on them. The greater magnates came to rule their territories as virtually sovereign princes. The Golden Bull of 1356 ended the disputes by requiring that the emperor be elected by the seven leading princes of the empire – a practice which will remain broadly in force for centuries to come. One result is that it ensures that emperors are elected who will not interfere with the autonomy of the princes, by now independent rulers within their own states. The Holy Roman Emperor is now Albert II of Hapsburg. The Hapsburgs are more interested in building up their own family lands than in the thankless task of restoring centralized power to the empire, and the family will hold the imperial title, with one short break, until the end of the empire itself (in the 19th century). In 1519, a monk called Martin Luther protested against abuses in the Church. This protest gathered a momentum of its own, sparking off that great episode in European history known as the Reformation. With the Holy Roman emperor, Charles V, seeking to uphold the Catholic Church, Germany descended into war. The Peace of Augsburg (1555) restored peace with the compromise that Germans must either be Catholic or Lutheran; nothing else. Their religion depended upon that of their prince – if he was a Catholic, so must they be, if a Lutheran, they also. Continuing tensions between the Hapsburg emperors seeking to impose Catholicism (and a more centralized control over the empire), and the German princes wishing to preserve their religious and political autonomy, led to the outbreak of the Thirty Years War in 1618. The war drew in many European powers, and German and foreign armies ravaged Germany. Perhaps a third of the German population perished. The Treaty of Westphalia (1648) has at last ended the fighting. Its many clauses include formal recognition for the 365 German principalities as autonomous states. Any remaining imperial power, on the part of the Holy Roman emperor, is now at an end, though he remains a figure of outstanding prestige within European politics. The outstanding development of the last century or more has been the rise of the state of Brandenburg-Prussia. 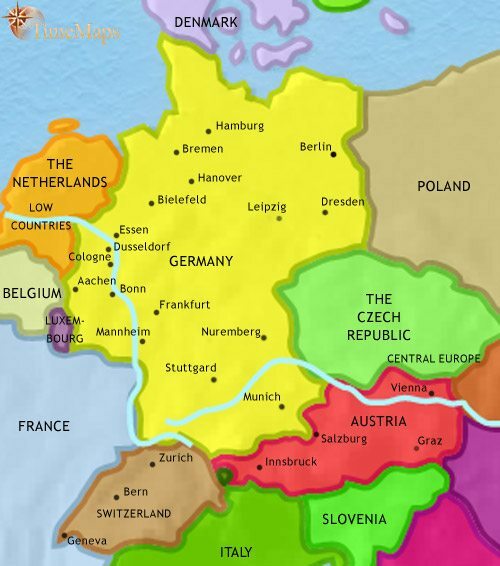 This state was, like much of Germany, devastated during the Thirty Years War (1618-48), under its very capable ruler, Frederick William (known to history as the Great Elector), it began its rise to power. He took every opportunity to strengthen the state economically, and was able to take advantage of Poland’s weakness to make himself sovereign duke of Prussia (1657). A generation later, his son was recognized as king of Prussia (1701), and the state expanded again when it gained much of western Pomerania from Sweden, by the Peace of Stockholm (1720). The next ruler was the stern militarist Frederick William I (1713-40), who devoted his efforts to building up an efficient army, which has stood at the heart of the state ever since. His son, Frederick II, “the Great” (reigned 1740-86), occupied the Hapsburg territory of Silesia. In the great mid-century wars, Prussia managed, sometimes by the skin of its teeth, to keep its independence, retain its Silesian conquests – and add some other territories along the way. In 1848, taking their cue from the revolution in Paris that year, a wave of revolutionary uprisings swept through the German states, demanding constitutional government and the unification of Germany. This achieved very little, and the conservative government of the princes had all won back control the next year (1849). In the years after 1849, the rise of Prussia to a position of leadership within Germany, under the brilliant statesmanship of its chancellor, Otto von Bismark, led inexorably to the Franco-Prussian War of 1870. The French army was crushed at the battle of Sedan and, following its victory, Prussia announced the creation of the German Empire. The German Empire is a federal system in which the constituent states retain much of their power, but are under the overall suzerainty of the king of Prussia, who now has the title “Kaiser” (“Caesar”, or “Emperor”). An Imperial parliament, the Reichstag, has been established, but it has comparatively little power compared to that of the Kaiser and his ministers. The unification of Germany presents Europe with a new power in its midst. Germany is the second most populous state in Europe after Russia, and, more importantly, one of the leading industrial powers in the world. Germany has become the leading industrial nation in Europe, particularly with regard to heavy industries such as iron, steel, coal, chemicals and railways. She is also by far the strongest military power, with an army built around the old Prussian army with its proud traditions, and a new navy that compares well with the British navy in the North Sea, in terms of size, equipment and efficiency. Since 1888, the German Empire has been ruled by Kaiser Wilhelm II. He soon encompassed the resignation of the great statesmen, Bismark, and broke free his cautious policies. He is determined to make Germany the leading power in Europe, if not in the world. Germany was defeated in World War 1, and the Kaiser went into exile. In the punitive Treaty of Versailles which followed the ending of the war, Germany lost much of its territory and had other humiliating conditions were imposed upon it. The treaty helped to undermine Germans’ faith in their new democracy, which took a further knock with the onset of the Great Depression, in 1930. Many looked to Adolf Hitler and his Nazis, who came to power democratically but soon turned Germany into a totalitarian state. They delivered on their promises to cut unemployment and restore Germany to a position of strength, but Hitler’s ambitions were by no means satisfied. His march into Poland brought about World War 2 (1939-45). The end of the war found Germany once again a defeated nation, its cities ruinously bombed, its industries all but annihilated and its land occupied by foreign armies. 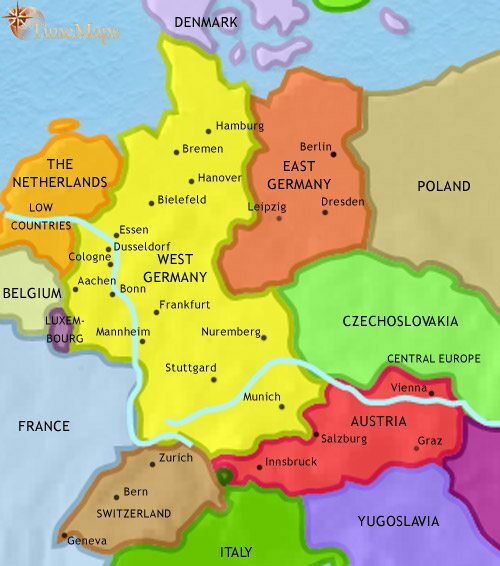 The country was been divided into West and East Germany. West Germany is a democracy, her people prosperous, and her political climate stable. She is a founder-member of European Common Market (founded in 1953), and in 1955 she was accepted as a full member of NATO. East Germany is governed as a one-party state by the Communist party. She is a member of the Warsaw Pact. Although, by Communist standards she has a powerful economy, she is falling well behind West Germany. In 1961 a physical expression of the division between Communist Eastern Europe and Democratic Western Europe was erected by the Communists in the form of the Berlin Wall. West Germany continued to thrive and enjoy continuing political stability. East Germany fell further and further behind her western sister in economic development – a main reason for the building of the Berlin Wall, which served as much to keep the East Germans in, as the West out. With the implosion of the Communist regimes in Europe in 1989, the Berlin Wall was torn down. This, more than any other event, symbolised the fall of communism in Europe and the end of the Cold War. The collapse of the Communist regime in East Germany paved the way for Germany to become a single country again, which it did in 1991. In the years which followed, the German people struggled hard to merge their economies together into a single entity, but they have succeeded in doing so, and Germany now has by far the most powerful economy in Europe.